Edmonton’s Infill Design Competition is an opportunity to encourage productive conversations about infill and help the public and development community understand what’s possible for infill design. The competition should demonstrate that infill can augment, rather than detract from the character of our established neighbourhoods. As a part of this competition, we are hypothetically engaged to provide redevelopment options to the owner of a single-storey bungalow on a property in an established neighbourhood in Edmonton. Our challenge is to find a solution that helps our client add value to their property while complementing the existing character of the community. Our client is talking to a neighbour about the possibility of consolidating their two lots together and they're open to all new forms of residential development. Opens possibilities to add density to a neighbourhood while keeping it residential. The landscaping gives to the street; engaging passersby, providing intimate space for the residents and a safe place for children. Recognizes and designs to the Edmonton winter and its opportunities. Remains urban with an impression of a village. Strong idea that would be improved with minor refinements to maximize the benefit of the concept. Edmonton has something that is unique within Canada: mature elm lined neighbourhoods that possess a variety of housing typologies (single family detached, duplex, walk-up and other multi-family housing types). Despite our profoundly beautiful green urban corridors, there is an absence of strong public and semi-public connections along these promenades. Introverted and unfriendly housing stock does not pay attention to the public realm; this represents an unrealized opportunity. In this design, we have sought to thoroughly study and define public, semi-public and private spaces by embracing the cold seasons to boost winter vigour, activity, and liveliness. The project creates dynamism and concentration by linking the qualities of the existing green urban grid to new semi-private communal corridors that results in an urban architectural experience that can compliment the city’s current green footprint. Our design introduces a new qualitative typology called INCLINATION, linking neighbourhood and nature by inclining the site to create an artificial hill that accommodates clusters of semi-private dwellings together. The 5% inclined surface allows people in cars to enter from the back lane while simultaneously facilitating a water feature/ice slide in the center of the street facing the courtyard. The inclined garden provides a comfortable, walkable and inviting appearance. It shows a defined framework for urban continuity by bringing public streets into conversations with semi-private courtyards. This cluster housing proposal consists of 10 units of duplexes arranged around a court, forming the main public communal space. The court is celebrated by a linear reflecting pool that transforms itself into an ice slide during the winter months. The entrances to the units are adjacent to their own front yard serving as food growing opportunities and acting as transition zones between the semi-public and private space. The living areas face the external perimeter where they have their own private patio/garden on the main floor that forms one main open living space. On the second level, the master bedroom faces the central space but is kept private with a timber screen. Adjoining it is a balcony which acts as the public platform by which the resident can relate to the garden and the other residents. 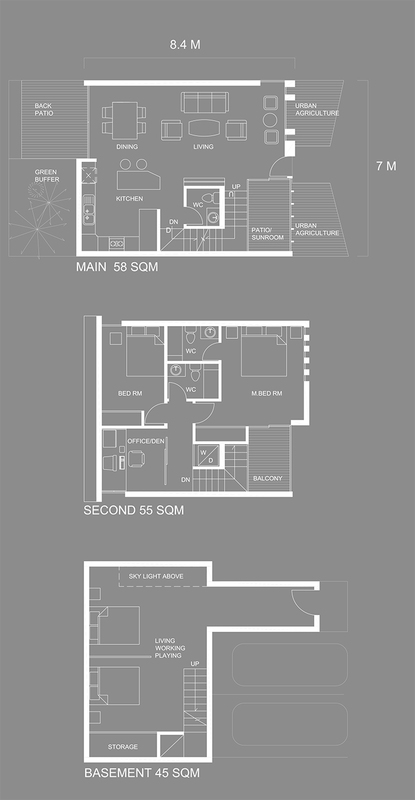 Each unit ranges from 135 to 155 sqm with 3 bedrooms and a flex basement unit that can be utilized as an office, guest bedroom, music room or even a home cinema. There is also a dedicated private underground car park area for two cars for each unit. Cheaper housing options in most typical suburban developments lack enough communal soul and amenity principles for families. This blurs the quality between private and public spaces and results in a loss of social sustainability for the residents and sense of belonging and community. INCLINATION aims to address this shortfall by providing more family-oriented housing options and answering to higher level issues such as densification, affordability and livability.